This past weekend welcomed another addition to my ongoing Tattoo Series – Curators of Art. For this photo shoot I had the pleasure of working with model and world traveler Theresa Manchester. She was a great subject to work with. Aside from a her beauty and considerable collection of body art, she came with quite a bit of experience in front of the camera. She also spends some of her spare time behind the camera. This all made for a great productive session as I was able to quickly and easily communicate and direct her throughout the shoot while she shared her many exploits around the world – some in places I have been myself. It was great to work with you Theresa. I certainly hope we get to collaborate again someday. For this shoot I kept it fairly simple and spartan as I typically do. I used the the Canon 5D Mark III. I started off with the EF 24-105mm f/4L but quickly switched to the EF 70-200mm f/2.8L IS II once we got into the rhythm of things. For lighting, I used two Canon 430EX speedlites in manual mode with Photix high speed sync RF triggers. I shot full manual the whole time for precise control of the camera, lighting and desired effect. The location was my private home studio. Key shots will make it into my limited edition collection prints from my Tattoo Series. Few will ever be published, however I felt I should at least share one (above). Below are a few behind the scenes shots. For BTS coverage I used the Canon 7D Mark II and EF-S 17-55mm f/2.8 IS USM on a tripod. I used the built-in intervalometer to trigger the camera periodically throughout most of the shoot. There is something about this ensemble that just inspired me to photograph it and since last fall I had been casually looking for the perfect subject to model it for me. Enter Jin. We got some good shots and I think at least one of them will make it to limited edition print. It was a great creative exercise. For the photographer in you: this shoot was done with the Canon 5D Mark III. Both the EF 24-105mm f/4 IS USM and EF 70-200mm f/2.8 IS II USM lenses were used. For lighting I used two Canon 430EX speedlights. Last weekend I had the distinct pleasure of photographing Jin. I had a specific look I wanted to capture. The look was a Vintage Versace look by Hannah Be from Retrospect Vintage Fashion. She’s an amazing stylist. Jin, my model was the perfect model for the look. She came up from Los Angeles for our shoot and has a great creative sense, style and energy. Her experience in front of the lens really made all the difference as far as how much we got done in just a few short and quick hours. After giving two looks a thorough treatment we still had a little time left. She suggested we play around with some pinup looks for Valentines Day. Here they are along with a few behind the scenes shots. I didn’t put much thought or effort into getting these shots just right but thought they were cute none-the-less. I hope you enjoy them and have a happy Valentines Day. I definitely have a lot of catching up to do. More than half of my final cut choice images shot last year have yet to be posted or printed. While taking stock this evening I stumbled across this image from a test shoot I did with Hannah over a year ago. This shot however was one of my personal favorites and remained all but finished until this evening. I just love the way her understated beauty comes through here. The complementary styles also give it a uniqueness. Those Red Boots! When she pulled them out I thought to myself “Oh my gosh! What am I going to do with those?”. I have learned to just go with the flow. I shot the Red Boots only after we had exhausted all her other looks. As it turned out, they were my favorite. I must credit Hannah for her sense of style. She is also an amazing hair and makeup artist. She did it all herself. This 330 Megapixel composite image was taken in my private studio with the Canon 5D Mark III and the Canon EF 70-200mm f/2.8L IS II USM lens at 150mm, 1/125 second shutter and ISO-640. For lighting I used two Canon 430EX speedlights. One with barn doors on left and one with soft box diffuser on the right. The speedlights were set to manual at 1/32 and 1/64 respectively. I used a slightly higher ISO than usual to pick up a bit of the warmth from the halogen track lighting above. I love it when test shoots yield unexpected gems. I definitely look forward to many more creative photo shoots with Hannah. I am pleased to finally and formally release the first limited print from a photographic series I have been working on for over a year now. Curators of Art is a pure, unfiltered look at fine art quality tattoo art work and the people who choose to collect and wear their art. It has been a fun, exciting and enlightening journey. I am not sure when work on the Tattoo Series will be completed or whether it will ever be for that matter but I will likely continue working on it through this summer. The first limited print of awesomeness I am making available is titled Wild Things. You can keep tabs on all future releases from this series on the link above to the Tattoo Series page. I said my new year’s resolution was to photograph and post about it at least once a week. I know I’m already a week behind, but I have good reason. With the little spare time I have to spend on my photography endeavors each week I simply did not have enough time left to write about it all last week. That was because I spent it all doing the actual photographing…lol. I spent last Friday evening working on the next subject [Naomi] for my series on tattoos and body ink. She was a great sport and subject to work with. I’m on a bit of a time crunch with this series as I would like to have it ready for exhibit/display by late this spring or summer. The entire series will be available for a very limited print run. My main goal is to present the subject of body ink and tattoos to a mainstream audience in a fashion that highlights it’s artistic qualities and present a different take on my subjects as curators of fine art. Below are some behind the scenes shots of our photo shoot as well as a sample. Because this series will be made available in limited print production only, I am less inclined to publish any of the images on the web. The main shots were taken with the Canon 5D Mark III and the Canon EF 70-200mm f/2.8L IS II USM. The behind the scenes shots were taken with the Canon 7D and the Canon EF-S 17-55mm f/2.8 IS USM. Two Canon 430EX speedlite flashes were used for lighting. Courtney, MUA working her magic. As part of my new year resolution, I plan on photographing something each week and post about it. I’m hoping this goal will motivate me to explore new photography subjects and techniques and grow as a photographer. So here we go! Tonight I decided I wanted to come up with a magazine quality product shot of a bottle of one of our favorite liquors: Tequila. I don’t really drink hard liquor (anymore), so I tend to amass a sizable assortment of the stuff every time I throw a party. 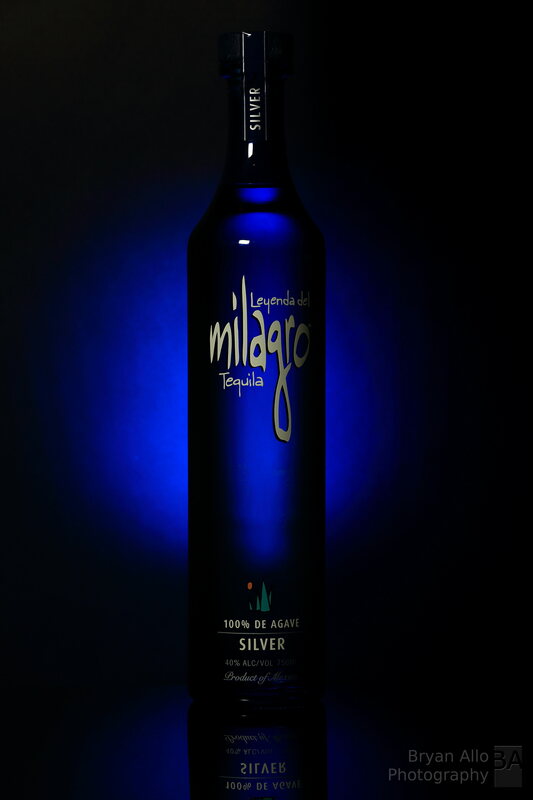 I have several bottles of Milagro in my stash and have always liked their design and presentation. I shot with the Canon 5D Mark III and the Canon EF 70-200mm f/2.8L IS II USM lens. I cannot say enough about how versatile this lens is. For lighting I used two Canon 430EX speedlights in full manual mode. On one I had a Strobies softbox and the other a honeycomb and lavender blue gel. The bottle was placed on a piece of black plexiglass I had laying around my workshop. I posted a cell phone shot of my setup. It was a good and fun exercise to shoot a product shot using the bare essentials and with no editing. The JPEG compression does not reproduce the subtle colors well. Without further ado, here’s what I came up with.